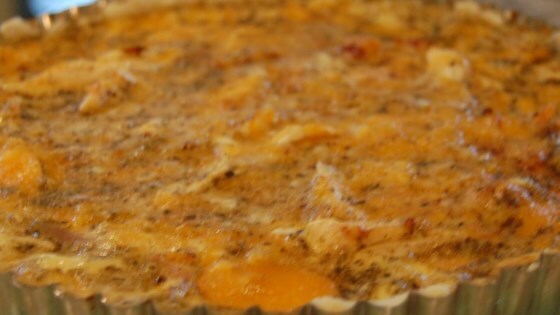 "An easy quiche that uses up the chicken left over from making soup stock! Note: The regular dry onion soup mix can be too strong; I use Lipton® Golden Onion Soup Mix." Spread crust into a 10 inch deep dish pie plate. Arrange chicken evenly over the crust. Cover with Gruyere cheese. In a small bowl, beat eggs with a fork; stir in milk, onion soup mix and Parmesan cheese. Pour mixture into pie crust and sprinkle with paprika to taste. Bake in the preheated oven for 15 minutes, then lower heat to 350 degrees F (175 degrees C) and bake for 30 more minutes. Let cool for 10 minutes and serve. The quiche looked pretty when I took it out of the oven but the onion soup taste was overwhelming. Maybe it would be better with half or a third of a package of the dry onion soup mix. Recipe was great. I'm on low carb diet so I made it crustless and substituted heavy cream for skim milk. It was still great! My husband even liked it. I will definitely make this one again! good stuff. Never made quiche before and now I've made it twice in a week. Also tried it with turkey ham. Works out great when you wanna have breakfast for dinner and no one else does. I thought this recipe was horrible. I made this for my parents & they didn't even like it. I ended up throwing all but 1 piece (the one that we all tried) out.